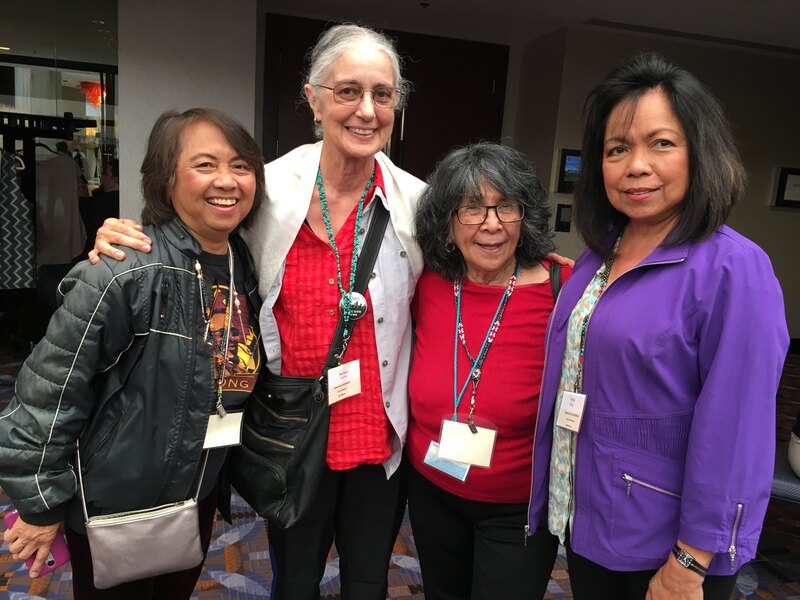 Rio Grande Chapter representatives and founder (from left): Tessie Greenfield, Barbara Gaerlan, FANHS co-founder Dr. Dorothy Cordova and FANHS Rio Grande President Pearl King. 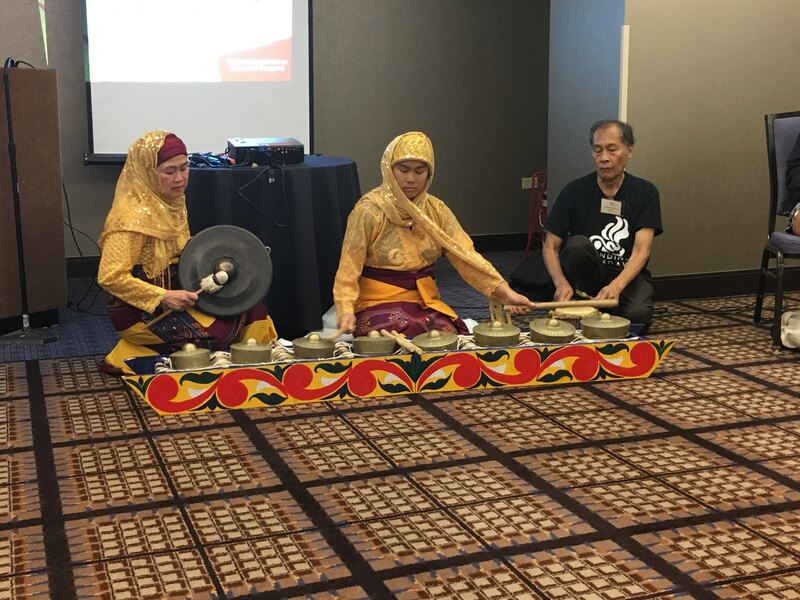 The 17th Biennial National Conference of the Filipino American National Historical Society (FANHS) was held from July 11 to 14, 2018 at the Hyatt Regency O’Hare, Rosemont, Illinois. 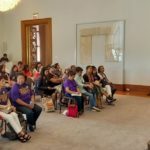 It was hosted by the Midwest Chapter with the cooperation of Greater Chicago and Wisconsin Chapters. The next conference in 2020 will be in Hawaii. NOTE: Click or double-click on each photo for larger image. 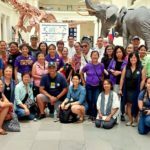 Lecture by Field Museum staff emphasizing on the joint projects of museum and the Filipino community. Pearl & Tessie at the lake front. 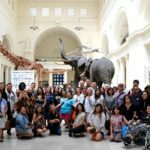 The event started with a tour at the Field Museum on July 11, Wed. Field Museum has over 20,000 artifacts from the Philippines. 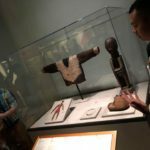 The museum has been working closely with the Filipino community in collecting some artifacts. 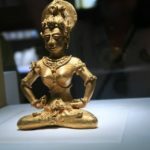 The main attraction is the Golden Tara which is called “Agusan Gold Image”, a 13th century solid gold statue of the Hindu-Malayan goddess from the Philippines weighing 4 pounds. Tour Group at the Chicago lake front. The bus took us to the Jose Rizal park then stopped for a group photo. 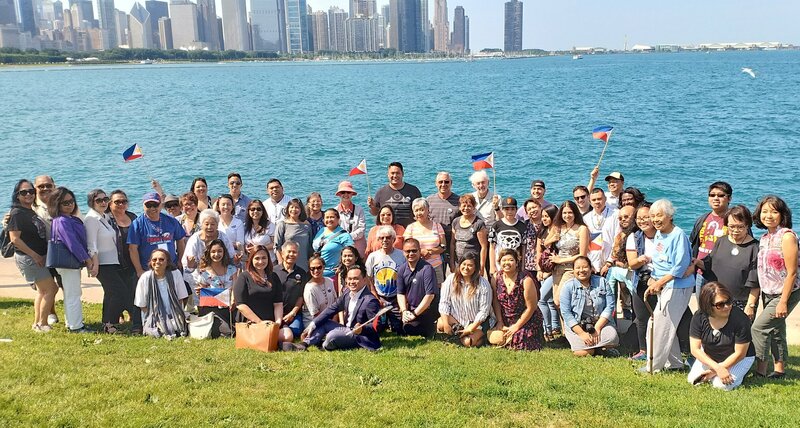 The hosts treated us to lunch at the Field Museum picnic area and later to the Seafood City Chicago with a fantastic Filipino band, SamaSama Project. The food made by the volunteers was great. 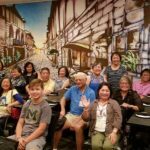 Video clips of the tour and reception can be viewed from our photographer and videographer, Jason DelaRosa’s YouTube channel. Click: FANHS Tour. Thanks, Jason. 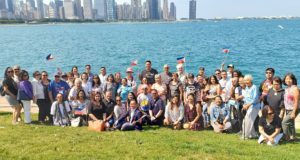 A glimpse of the band can be viewed from the Chicago FB website: Click on: Filipino American National Historical Society – FANHS Chicago. 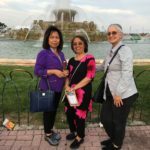 Pearl, Tessie & Barbara at the Buckingham Fountain at the Taste of Chicago festival. Tessie with Dr. Dorothy Cordova. 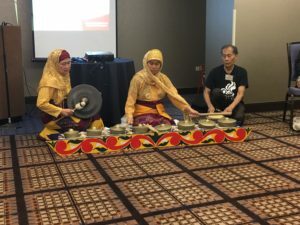 There were around 180 presenters at the Conference (July 12-14) which started with a plenary session, then workshops/lectures, reports from 35 chapters and capped with a Gala on Saturday. For list of workshop/lectures, click on: Present sched FANHS 2018(4). Tessie taught a samba dance to the music, A Samba Song, as a tribute to Bong Penera, a Filipino Jazz musician based in Chicago. 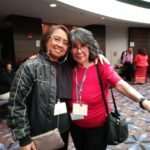 Pearl and Tessie read the poem about Larry Itliong, the Filipino union leader. The authors displayed their books for sale during the entire duration of the conference. 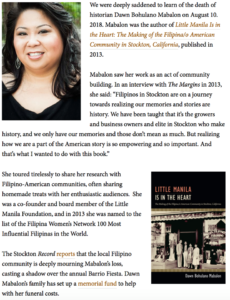 There was also a bazaar of Filipino books and items. The guest speaker at the Gala was Philippine Consul General Israel Romulo Jr. 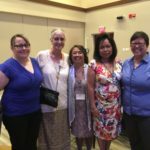 The induction of new national FANHS officers was the highlight of the gala. Barbara Gaerlan, one of Rio Grande members, is with the Executive Committee of FANHS National. 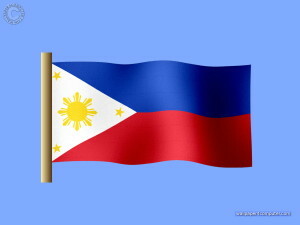 Another Filipino band also played at the gala. Che Guevarra, daughter of Chari and Cesar Guevarra, who all used to live in Rio Rancho and friend, Jennifer, joined us at the Gala. 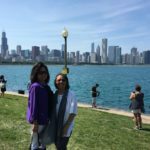 After the workshops, we managed to go to the Taste of Chicago Festival in downtown Chicago where you could taste all ethnic and American food. 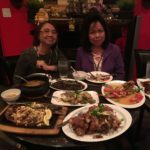 We also went to a Filipino restaurant, Kusina de Manila. We had a great time! 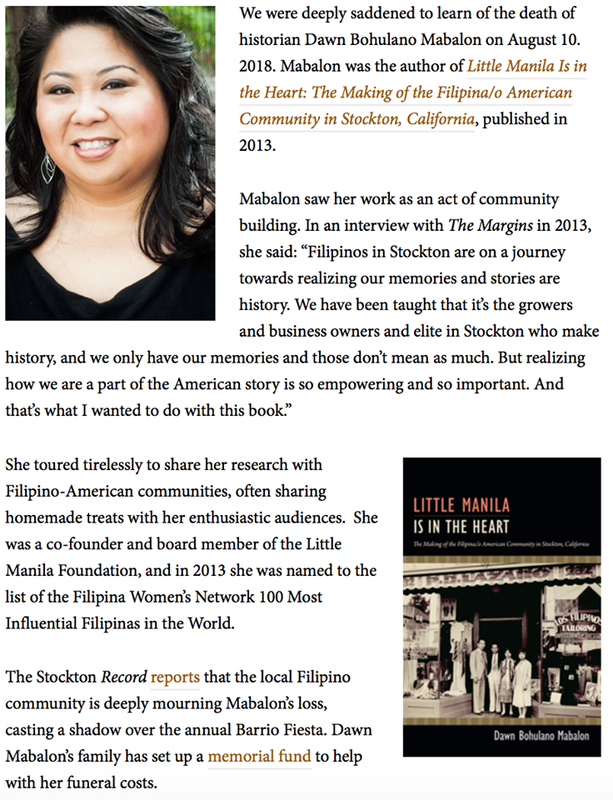 Thanks to Jason DelaRosa (photos/videos) and Pearl King (photos). See you in Hawaii in 2020!! !